Head to Bear Moon Bar & Grill for a drink (Happy Hour is 4 to 6!) or a tasty meal of upscale Pacific Northwest cuisine. Splash around in the fresh air or stay toasty inside - an indoor/outdoor pool gives you the best of both worlds. Thinking family game night? See who's best at billiards or foosball. Start shredding Heavenly asap with the Gunbarrel Express lift just 6 minutes away by car. Explore the shops and dining downtown on South Lake Tahoe Blvd, only a 4 minute drive. 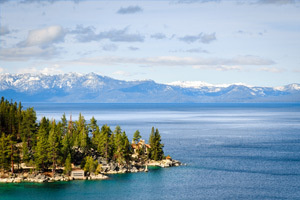 Staying right on Lake Tahoe provides both scenic views and exciting water sports. Enjoy a refreshing swim in the outdoor pool heated all year round. Went a little hard on the slopes? A deep tissue massage will fix that. Relax with a soak in the indoor hot tub after a day on slopes. Pack your hiking boots! Van Sickle State Park Trailhead is just a 7 minute drive from the resort. Drive just 4 minutes away to work on your swing at Bijou Municipal Golf Course. Inviting studio condos are nearly 300 square feet, sleep two guests and feature kitchenettes for quick, not-too-fancy meals. Need more space? One- and two-bedroom condos run about 600 to 900 square feet, sleep four to six guests and include full kitchens and fireplaces. Flat screen TVs have premium channels and DVD players, perfect for when it’s time to cozy up in the living area for family movie night. Have the kids take turns choosing the movie from the resort’s DVD rentals, (but maintain veto power for the sake of your whole crew). Look forward to quality z’s, thanks to the premium bedding, blackout drapes and crazy-active days on the mountain or lake. If you’ve hit the mountain hard and are ready for a night out, you’re in luck (no pun intended). The Casino District is just a mile away. Check out the Hard Rock Hotel & Casino, or Harrah’s for live entertainment Tuesday through Saturday in the Center Stage Lounge. Shopaholics will want to make a day of it at The Shops at Heavenly Village. Sockaholics (clearly it’s a thing) will make a beeline for Sock City for thousands of options, including novelty, slipper and toe socks. Little Blue House by Hatley has children’s clothing in colorful prints. And Del Sol sells t-shirts, jewelry and nail polish that change colors in the sunlight. When it’s time for lunch, California Burger Co. has you covered. Then finally say yes to the kids’ 137th request to stop at Nestle Cafe for some signature Toll House goodness. This property allows only 2 parking spaces per reservation. RVs, campers, and boats are not permitted onsite. For more details, please contact the office using the information on the reservation confirmation received after booking.